Bust out the decor! This one seems like a given, but even if you don't have a lot of Valentine's Day decorations, it's still fun to get them out (or a good excuse to go get some!) and set up little vignettes around the house. I personally don't have a ton of Valentine's Day decorations, but I still like to put out what I do have to feel festive and put a little extra love in the air. Some of my favorite stores to get Valentine's decor from include TJ Maxx, Home Goods, Target, Pier 1 and Hobby Lobby. These stores offer really cute items for a great deal! 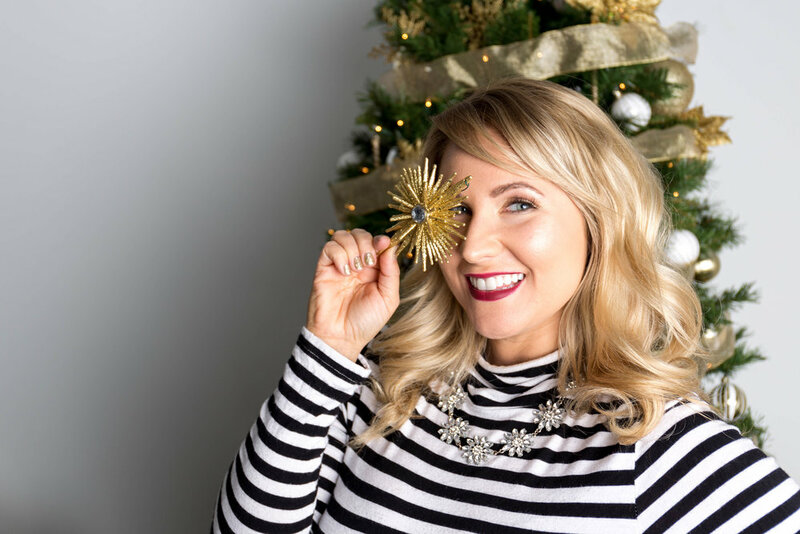 I don't usually like to spend a ton on seasonal decor since it's only out for a month or so; I would rather splurge on the items out year round, so it's easy to indulge in the seasonal decor when you know you aren't spending an arm and a leg! Get a love themed candle! You probably won't meet someone who loves candles as much as I do. I constantly have one burning in our house (okay maybe even more). I think candles are the perfect accessory to make your house nice and cozy and while I was grocery shopping at Meijer last weekend, I found the cutest Hallmark candle that smelled like a vanilla cupcake. It had a cute heart shaped cupcake with red and pink sprinkles on it. Candles are perfect for making your house smell amazing and the festive label is an added bonus! Buy a cute outfit for Valentine's Day. This is something I do every year; I love a good theme and so I always am sure to wear a shirt or dress for whatever the holiday is. This doesn't have to be anything cheesy, even just wearing something red or pink that day can make the day feel a little more special. Sometimes work or even life can get a little mundane so it's fun to do something out of the ordinary and partake in the holiday and have something to look forward to. Even if you're not with anyone special, it's still fun to take the time to dress up for the occasion! Plan your Valentine's day. Now this is the most fun! Take the time to plan some ideas of how you would like to spend your Valentine's Day. Whether your are single, dating, married, or whatever, Valentine's Day can be a lot of fun! If you're single, plan a Galentine's Day with your best girlfriends and order pizza and drink wine, or even go out dancing! A lot of places now offer fun alternatives for the single gal on Valentine's Day. If you're dating or married, plan something different this year. While the tried and true method is dinner and maybe a movie, instead see a concert together, or if the weather permits, have a picnic outside after a hike. I know this year is extra special for Brian and I since it's out first Valentine's Day married and we have been brainstorming ideas how to spend the day together.